Quickly! Grab a dictionary, and look up the word incredible! You should see a picture of a man next to it. The man, Patrick Hemer. Not only does he have one extraordinary voice, the man can play guitar in such a way that it demands you listen! And his role in the guitar world doesn’t stop there; he has a deep connection to the heart of it. This is a man with a true passion for what he does. “More Than Meets the Eye”, man this album is so amazing. Obviously, ‘more than meets the eye’ means there is something more there, something underneath. A sort of music that can dig into the deepest part of your soul and put it all out there, so to speak. A type of music that is mighty potent when you aren’t expecting it, like a snake bite on a hike in the mountains. You don’t know how to initially react, and there is nothing you can do but roll with the punches. There isn’t anything I don’t like about the album in all honesty. I mean, no one is perfect, even someone like Hemer. There is always room for improvement, because that is the reality of life. We all must progress, and when we think we are at our best, we can get better. I think this album is one that not only Metal fans could enjoy, but even classic rockers could. The man has lived up to his legendary status, and I give him props for doing so. 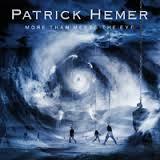 I like that Hemer isn’t just some big headed guy with a guitar and a mediocre voice. He is so much more than that. He is the godfather of Guitar.